The Super Seal 26 is a modern-styled lifting keel fast cruiser, designed by Ron Holland, of Kinsale in Ireland, at the time one of the most successful small racing yacht designers. With a deep, high-aspect ratio drop keel, and an efficient 7/8 fractional sloop rig, she offers excellent sailing performance plus the ability to use drying moorings, and well-fitted, comfortable accommodation for up to five. In December 2000 "Sailing Today" magazine listed the Super Seal as one of the "top five used boats of the year", along with some old favourites such as the Contessa 32 and Elizabethan 30. Their review gave it five stars for performance, and four for accommodation, which they described as ".... much better than you would expect in such a fast boat." Super Seals were originally built by John Baker Ltd., of Kenton Forge in Devon, builders of the smaller Seal 22 cruiser and Otter dinghies. In 1981 the design and moulds were purchased by Parker Yachts of Poole, and production continued for a time as the Parker Super Seal. The basic design was updated eventually to become the Parker 27, which used the same hull moulding, and the Parker 275 and then Parker 285 which were built from a new, larger moulding. Whilst not a yacht one would choose for ocean passage-making, the Super Seal 26 is well able to cope with cross-channel or similar offshore passages. The Super Seal 26 has five berths, although she would be definitely be a little cramped if cruised by five adults. She is ideal for a couple, or a family with one or two children - for whom the ability to dry out on a beach is a major asset. 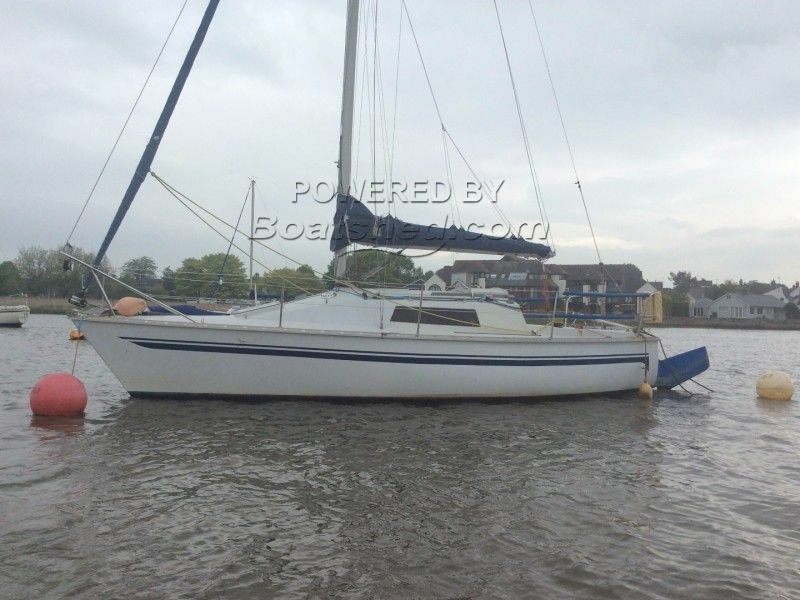 This example is two times winner of Topsham Sailing Club Season and ready to sail away. This Super Seal 26 has been personally photographed and viewed by Phil Key of Boatshed Torquay. Click here for contact details. "Whilst not a yacht one would choose for ocean passage-making, the Super Seal 26 is well able to cope with cross-channel or similar offshore passages. " What makes you write this sentence? The freeboard is amply high and the ballast is very good at 46%. Is it then a flimsy boat, not a real boat? Mast stepped a minus? Do tell me please, I am eager to learn.